Posted January 29th, 2018 filed under Alert Services, API, Small Biz, Small Business, Text Alerts, Toll Free. Toll-Free have been around forever. It has improved customer service for many businesses. Today, Toll-Free has evolved and is used even more. If your company has a Toll-Free number as part of your customer service centre or appointment reminder system, take it to the next level: Add text by connecting to a SMS API from a text message aggregator. Toll-Free 800 series numbers can now send and receive text on select aggregators. Professionalism – Use one universal customer/client facing business line for text and voice. Responsiveness – Texting back clients can improve support. Documentation – Help recall important info via a simple text message. Reduced Hold Times – Make customers happy. Don’t keep them waiting. 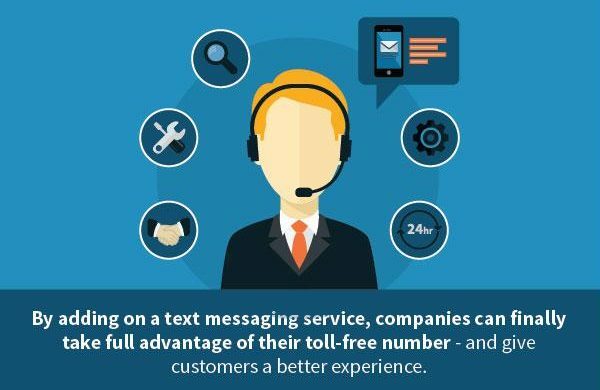 The above four benefits offer compelling reasons to add SMS text messaging to your Toll-Free service. Of course, domestic text messaging has no long distance fees regardless, but your business can now use text messaging providing a seamless point of communication for your business. You cannot ignore that text messaging is now the preferred way a lot of people want to communicate. 75 percent of millennials would rather text than call. This group considers SMS more convenient, less disruptive and more memorable than traditional phone calls. Beyond customer service departments, Toll-Free SMS can also benefit medical offices, auto repair shops and other businesses that schedule appointments. These organizations can use texting to send out appointment reminders, which is how millennials prefer to be reminded. Toll-Free numbers look professional, and are very convenient too. Toll-Free SMS may not be a service your current 800 service provider has and it gives a reason to switch to an experienced SMS aggregator that offers Toll-Free. Adding Toll-Free SMS to your existing, or new line is easy and you don’t have to worry about disruption of service. Select SMS aggregators that offer the service can manage the setup for you. Swift SMS Gateway makes the process of adding SMS functionality as easy as possible. Toll-Free SMS is an add-on service available for API 2 and API 3, and Small Biz service clients. Our APIs are fast to roll out, so your organization can act quickly. With unlimited access to a library of simple scripts and the global reach of over 800 phone carriers, the possibilities available to your business are endless. Learn how to add Toll-Free to your existing Swift SMS API plan, or if you’re not using Swift SMS yet, try a free demo today of up to 50 messages.